News We’re very excited to announce the upcoming launch of our new website! We are making changes to the site to make it easier to view our portfolio of completed work and the progress of current projects . We are also adding buttons to simplify sharing photos of your project with your friends and family. News SoCal PaintWorks was featured on GoodMorning San Diego with Dave Stall onWednesday, June 13th on KUSI. A big thanks toMikeMitchell, Gary Forseth, and Dave Jacks for coming out! Even on a cloudy day these cars shined! 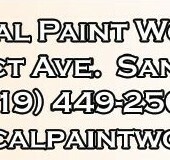 To see the video visit us on Facebook: www.facebook.com/SoCalPaintWorks or GoodMorning San Diego’s website. http://tinyurl.com/socalpaintworks.